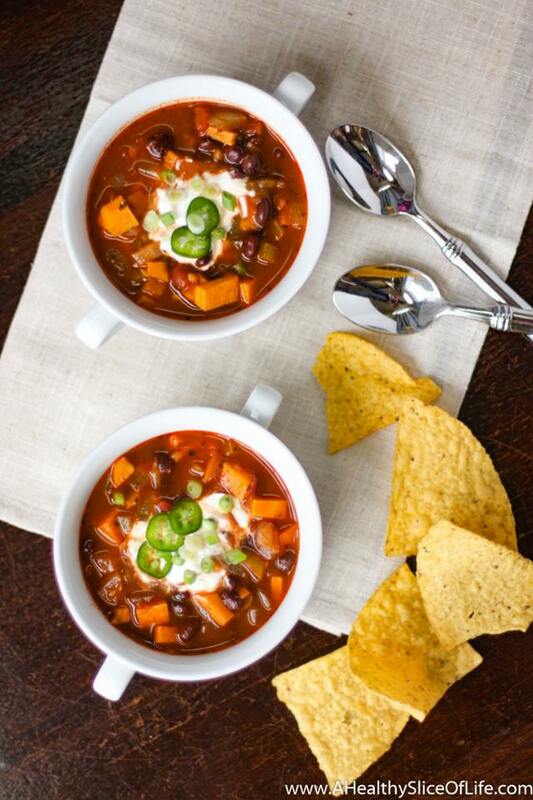 This spicy vegetarian chili is hearty enough to satisfy the most ferocious of appetites. Filled with fiber-rich black beans and sweet potatoes, it’s a healthy and delicious vegan dinner option any night of the week! Once upon a time I thought anything could go in the crock-pot. Perhaps it was the time-strapped new mom in me, but I figured why cook any soup or stew stove-top? Might as well toss it all in the slow cooker and hit go right? Well, no, I was wrong. Not everything translates to the slow-cooker as well as this delicious black bean soup does. I’ve been trying to go back and test recipes I posted on here a while ago to ensure they are share worthy as I revamp my recipe section. 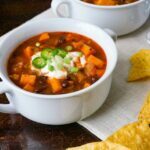 I came across my crock-pot sweet potato and black bean chili and though every fiber in my being wanted it to turn out, the crock-pot version just didn’t have the same zing, texture and deep flavor that I wanted it too. But fear not, when made in a giant pot on the stove, this chili is phenomenal. It’s hearty, with a bit of spice, and will definitely leave you feeling satiated and cozy. 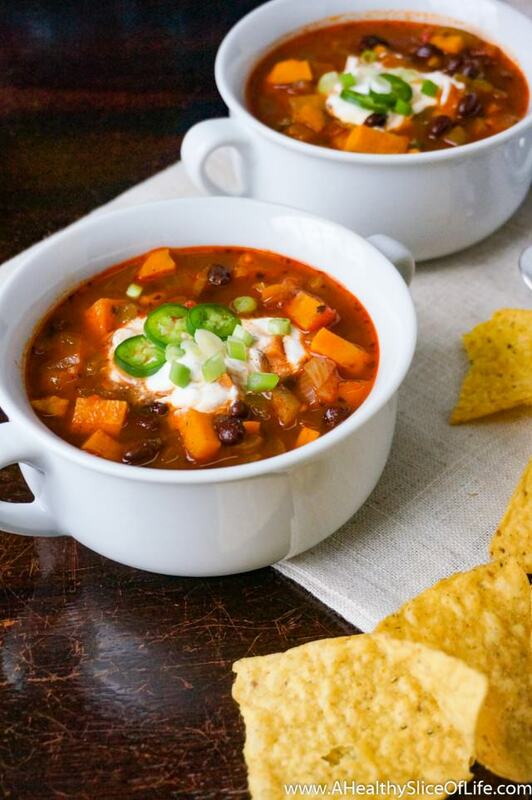 This spicy sweet potato and black bean chili #recipe is perfect for a fall or winter #meatlessmonday meal! Since I don’t want you to miss out on this delicious vegetarian meal, I redid the recipe to do the flavors justice and wanted to share it with you today. 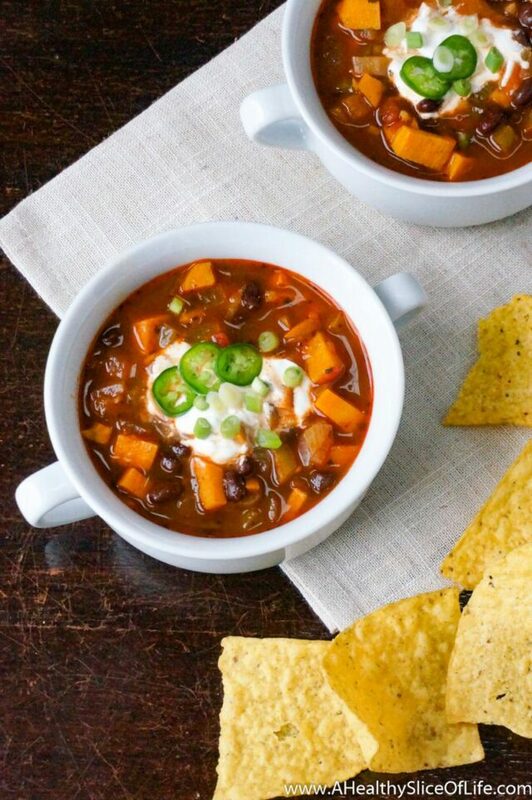 If you’re a meatless Monday fan, but maybe your husband isn’t, try this chili. If you have friends that don’t believe vegetarian meals can be filling or satisfying enough, make them this chili. If you are only cooking for one, this meal only gets better each day so eat it all week or freeze it, but still, make this chili. I promise, you’ll love it! This spicy vegetarian chili is hearty enough to satisfy the most ferocious of appetites. Filled with fiber-rich beans and sweet potatoes, it’s a healthy and delicious vegan dinner option any night of the week! Add onion, stirring occasionally for 10-15 minutes or until soft and translucent. Add bell peppers, jalapeno & sweet potatoes. Cook, stirring occasionally, for 5 minutes. Stir in garlic and cook one minute. Add chili powder, salt, cumin, pepper, red pepper flakes, basil and bay leaf. Stir & cook 1 minute. Add tomatoes & broth. Simmer uncovered for 30 minutes. Stir in beans & continue to cook for 10 minutes. Remove bay leaf & stir in lime juice. What is your favorite vegetarian dinner to make? During the colder months I love hearty, filling veggie soups. I just made one with turnip, celeriac, and carrots – perfect for the season and so healthy! My sister is due any day now and I’m definitely marking this recipe for her.. Ok, some for me, too! 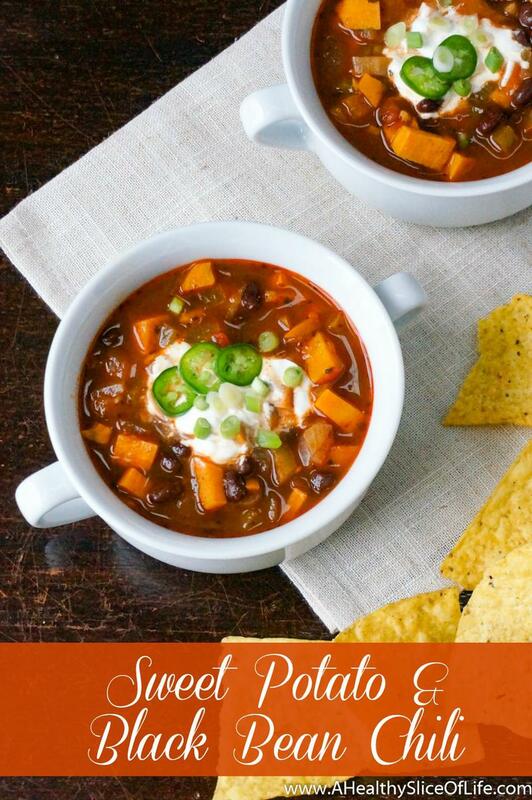 I love anything with sweet potato, so this sounds like the perfect winter meal to me. Typically I go with pasta for our vegetarian meals… pasta with roasted veggies and a hearty red sauce, usually baked as a casserole. Looks delicious and SO warm and filling for a winter dinner! Ok, Ok…I loathe sweet potatoes but I might still try this one. Looks delicious and maybe the spices will cover the sweet potato enough! I think there’s a time and place for the slow cooker. I used it to make some really delicious green beans for Thanksgiving and when I was first learning to cook, it gave me a lot of confidence. Now, I will opt for my Lodge dutch oven instead of the slow cooker. It is almost just as easy and the flavor of the soups and stews come out so much better! I also love that I can sear meats on it while on the stove and then pop it in my oven to finish off the cooking of the dish. It’s magical. Yes, I love meatless meals at least once a week. It’s not always Monday. Mmmmmmm that chilli looks delicious!! I make a kick arse roast pumpkin and millet baked risotto. I tried making risotto in the slow cooker. Utter fail. It came out like glue.